Palmetto Harmony is a retailer of natural essential oils and only sells organic products. They offer hemp oil that contains full-spectrum CBD. Their products are legal, safe, and do not get you high. Their products are all third-party lab tested by an ISO certified lab. This is to ensure consistency and safety in all products. According to their website, their products are all derived from organically grown hemp that doesn't include any pesticides or harmful microbials. They offer two different strengths of full spectrum cannabis oil, the popular 100ml which retails at $220 and the 30 mls which retails at $90. Buying the 100ms definitely saves you some money. This oil is derived from organic whole plant cannabis extract and contains a broad terpene profile. It contains no artificial flavoring or additives. For consumption, place a few drops under the tongue and leave for 15-30 seconds before you swallow. They offer a full spectrum transdermal patch with 30mg of CBD, it is sold online at $19. The patch is designed to released small doses of CBD at intervals, but it has no chemicals added which makes it very safe for the skin. The patch lasts up to 12 hours and it contains menthol, camphor, methyl salicylate, mineral oil oleic acid and 30mg of hemp cannabis extract. They also offer a topical Psorian Cream made out of Organic East African Shea Butter, Beeswax, Gotu Kola, Comfrey Root, Calendula, Marshmallow Root, Lavender and hemp oil. The concentration is 100mg/2oz jar which sells at $39.99. It needs to be stored at 75 degrees or below because it liquefies when exposed to higher temperatures. Lastly, they sell a topical cream, Holy Cannacense, made out of Organic East African Shea Butter, hemp oil, Holy Basil, and Frankincense. The Palmetto Aura vape oil is packed in a 15ml bottle and is best used to calm the mind and soothe inflammation. They also sell a ceramic coil pre filled vape pen that comes filled with the Palmetto Aura vape oil. The pen is rechargeable and reusable. It is also inbuilt with a firing protection and low voltage protection features. The pen sells at $19.99. 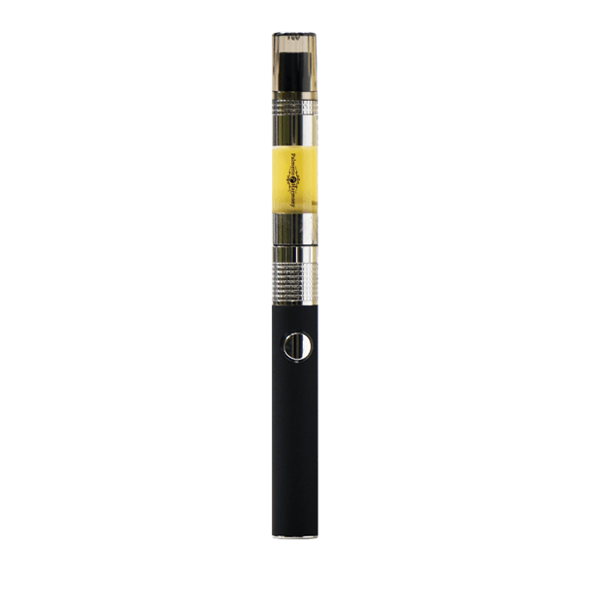 You can use one of our Palmetto Harmony coupon codes to save 10% on these vapes. 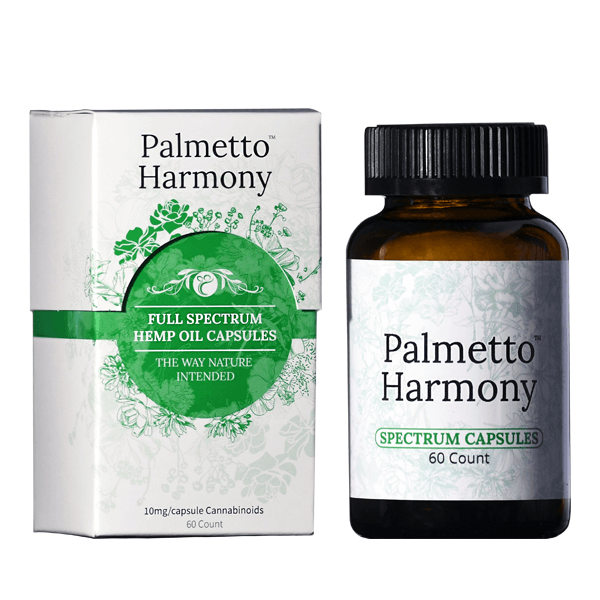 The Palmetto Harmony 60 count spectrum capsules are packed with antioxidants and omega 3, 6, and 9 fatty acids. Each capsule contains 10mg of CBD. 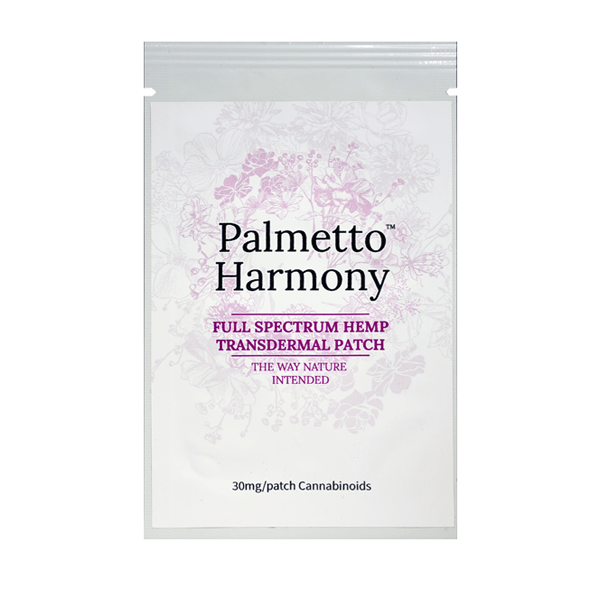 The Palmetto Harmony Spectrum Suppositories are ideal for quick absorption and work as a strong anti-inflammatory. This unique delivery method provides greater bioavailability. It is available in a 7 count pack with each suppository containing 10 milligrams of cannabinoids along with a wide variety of terpenes. 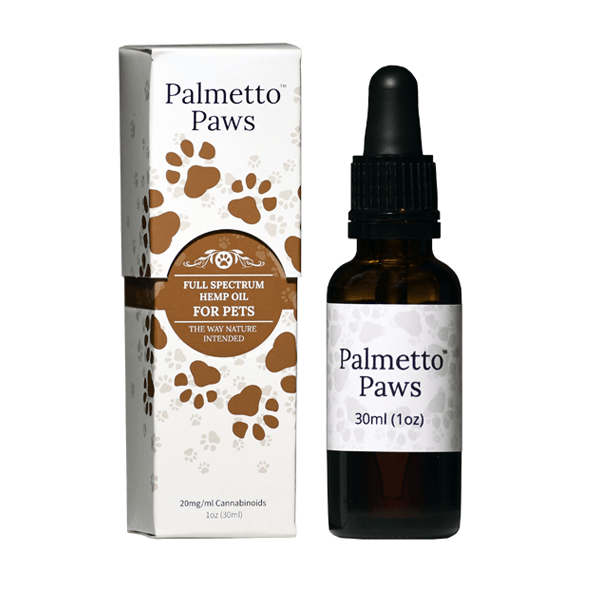 Palmetto paws come in 30mls and 60mls and is ideal for both cats and dogs. It is a whole plant extract infused into fractionated coconut oil and contains a broad terpene profile with 20mg of cannabidiol in each ml. It contains no artificial flavoring or additives. These products are safe for your pet and won't get them high. All their products are third-party lab tested (by an ISO certified lab). Every batch is tested for not only cannabinoid content and terpenes, but also mold, pesticides, heavy metals, microbials, herbicides, and residual solvents. Lab results are available on request. Their plants are grown with one hundred percent organic practices; they only use combative pests instead of chemicals like pesticides. Disclaimer: The following reviews are made by consumers. Palmetto Harmony has not reviewed and therefore doesn't endorse, support, or approve the reviews or recommendations left by consumers. These statements have not been evaluated by the FDA. Palmetto Harmony products are not intended to diagnose, treat, cure, or prevent any disease.